I’ve created this page to share my passion for cooking traditional whole foods meals for my family. I take pride in my kitchen work and the food I choose for my growing children and hard working husband – oh, and me too. 🙂 Eating traditional foods has changed our lives. I hope you enjoy these recipes. When ready to bake the cookies, preheat the oven to 375 degrees. Drop the mixture from a teaspoon onto a buttered or oiled cookie sheet. Press flat with the bottom of a glass which has been dipped in flour. (An option is to brush the top of each cookie with melted butter and/or honey but watch them closely so the tops won’t become too brown) Bake for 12 minutes. Makes about 30 cookies. This recipe is one that I adapted for the traditional food way of preparing grain recipes from a cookbook called Baby Gourmet Cookbook by Mary Bayley Fisk. It was published in 1975 by Determined Productions, Inc.
I’ve used this recipe with both blue gill and catfish now, and both turned out excellent. I have about 5 – 8 fillets to start with. Mix the egg with the buttermilk (or whole milk). Mix the dry ingredients. I use a liberal amount of salt and curry powder with a pinch or two of the cayenne. You mix to your preference. Wallow the fillets in the liquid, then coat in the meal and spices. Fry in a hot skillet in bacon grease (iron always produces the best results) until the fish is flaky and the batter is browned (golden). Yum! This is a traditional Appalachian recipe that is great when you have an abundance of green onions and lettuce in your garden. 🙂 It will also work for most types of greens (kale, mustard, turnip, etc…) Fill a large iron skillet (12 inch) with lettuce and onions. In a small iron skillet, melt 1/4 cup of bacon grease with a tablespoon of butter. When the grease and butter are melted, pour the hot grease over the lettuce and onions little by little mixing it as you pour. The lettuce will wilt (become “kilt”) and the onions will be soft. Sprinkle sea salt to taste and eat hot. A little of your favorite vinegar is a good condiment along with a good pone of cornbread. Note: This recipe assumes you save the drippings from bacon fixing. I use bacon grease a lot in my cooking and save it every morning. If you don’t save yours, make some bacon for the grease. You can crumble the cooked bacon and sprinkle it over the killed lettuce and onions. This recipe was adapted from one found in the Foxfire Book of Appalachian Cookery. I have added to that recipe my own twists and those “secret” ingredients passed to me by my grandmother Ida and my daddy. Grease a 9″ cast iron skillet with lard or bacon grease. Place it in an oven heated to 425 degrees to get hot. Sift any bran out of the cornmeal. Measure the cornmeal, soda, salt, and sift together. Mix in beaten egg, milk, and melted lard or bacon fat (butter will do in a pinch). Add sorghum (optional, but a little sweetness is necessary in the opinion of my family). Pour into the hot greased skillet and bake in a 425 degree oven. It will be ready in 20-40 minutes. Keep a good watch on it. Sometimes it might be necessary to cover with foil part way through baking to keep the top from burning. It’s done when a fork stuck in the middle will come out clean. Traditionally served with Soupbeans. *Note: It is highly important to me that I use non-GMO corn in my house. I don’t support industrialized agriculture if I can at all help it as it will be the downfall of our food supply. Some genetically modified corn is in and of itself a registered insecticide. Insecticide is not food. So, I will use only organic cornmeal or fresh ground meal from a grower that I know uses non-GMO seed. I also use unrefined and non-iodized sea salt. I find it equally important that my bacon be free of nitrates/nitrites and MSG. 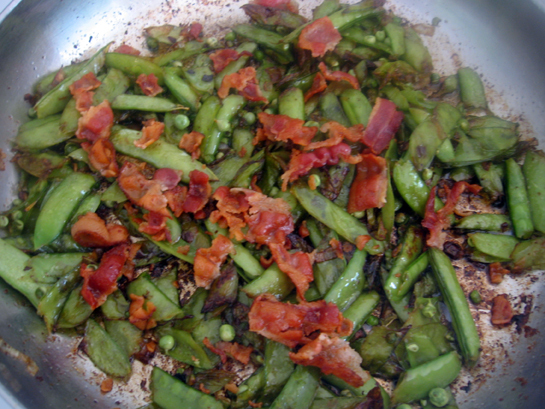 See this post for my recipe for Southern/Appalachian style green beans. A good addition to any meal of any season. At Edible Aria there is a really good explanation of stock making and a quicker, differently suited recipe. Check it out too. Peel and slice fresh apples (you can also use frozen). Some people leave the peel on. Place in a skillet over medium to low heat with a tablespoon or more of butter… I’d say a tablespoon for every two apples. I also add some unrefined coconut oil for flavor. Add the spices… nutmeg, cinnamon, vanilla to taste. Sweeten with a bit of honey if you desire. Stir with a spatula often until the liquid starts to caramelize and the apples are soft but still hold their shape when knocked around. Serve… They are yummy with about any breakfast foods and pork dishes for supper. How delightful you blog is. I found out about it through Blind Pig and the Acorn. I love grits the Appalachian way. When I moved to Florida, nobody would ever dream of putting honey on their grits. They put cheese and gravy on theirs. When I told them how I make them, them just laughed. I wish I had a plate full of Kilt Lettuce and Onions. Oh my – My grandmother made lettuce and onions. When she died in 1998, none of us knew how to make them. I had forgotten all about that dish until reading this – thanks for posting this recipe- brought back some memories of a steamy kitchen full of grandma’s love and good cookin’. Thank you for these. My family is actually all from SE Kentucky and I am very active in genealogy and we love to visit down there. My grandma taught me to cook and I love Appalachian recipes. We make fried apples, apple candy,white beans, and white cornmeal gravy all the time. I’m always looking to expand since I can’t go see my Grandma as much as I’d like! The kilt lettuce is similar to what we call wilted lettuce. We add chopped egg and mix cider vinegar with the bacon grease and some crumbled bacon. Absolutely love this…it really brought back memories 🙂 Thank you so much for sharing! Good work! I found your blog when I went looking for an old-timey recipe for green beans. Yours is just about the way most people in my part of the NC mountains cook them. I look forward to reading more of your blog.